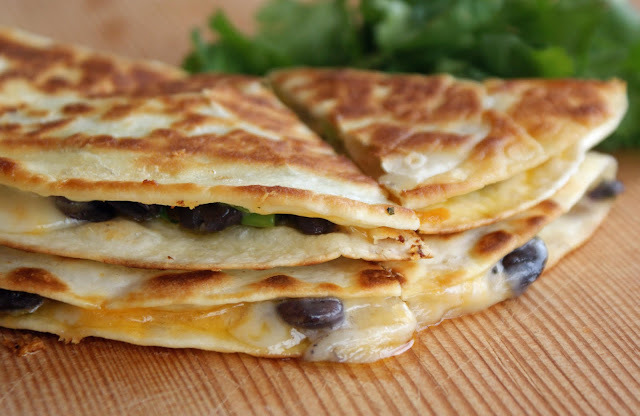 This recipe makes one delicious quesadilla, just enough for a lunch. Add a big green salad and it becomes a hearty dinner. I use low fat cheese and leftover cooked chicken or beef to make it an economical and slightly more healthful Mexican treat. Quesadillas are the perfect meal in a hurry. Keep tortillas in the freezer and you can have a meal on the table in just a few minutes. Heat a heavy griddle or fry pan over a medium heat. While the griddle is heating, put the olives, chicken or beef, cheese and salsa in a bowl and toss together. Spray one side of each tortilla with cooking spray. When griddle is hot, lay one tortilla on grill, sprayed side down. Spread filling mixture over the tortilla and cover with the other tortilla, sprayed side up. Cook 3 - 4 minutes, or until cheese has started to melt, and you get nice grill marks, then flip and cook other side for another 3 to 4 minutes. Remove from the pan. Cut into wedges and serve with taco sauce, guacamole or another favorite dipping sauce. This makes 1 quesadilla – double, triple, or quadruple for more servings. sounds delish! I have a sandwich griller, I wonder if I can use that. Oh they are very morish Angela. In fact they are a regular Thursday lunch for my mother and I after we do her shopping. Yes, by all means use your sandwich grill. I'd start with leaving the top raised and turning as you do for the griddle or pan. Then, if you're brave you could try it with the top down, and only cook for about 3 minutes. The top may well be too heavy and squash the quesadilla though, but you'll never know if you don't try it.